Australian Careers Network (ACN) has been placed into administration, marking the end of the company’s troubled time on the Australian Securities Exchange and almost certainly the prelude to its liquidation. This follows the Federal Court dismissing action brought by ACN subsidiary Phoenix Institute against the Department of Education for cutting $40 million federal funding to the scandal plagued college. Justice Mark Moshinsky found while the Commonwealth was technically obliged to make the funding payments to Phoenix, the “decision by the Commonwealth to defer the advance payments were valid”. Phoenix is one of 5 providers/brokers that the Australian Competition and Consumer Commission (ACCC) is pursuing in the Federal Court for, among other things, allegedly making “false and misleading statements and engaging in “unconscionable conduct”. The ACCC is seeking recovery of VET FEE-HELP (VHF) payments and cancellation of VFH student debts. The placing of ACN into administration makes any recovery from Phoenix a most doubtful proposition. ACN operates a host of colleges, including Consider This Training, Cove Training, and Smart Connection. The colleges have campuses throughout Victoria, NSW and Queensland. ACN also runs from Sydney the Australian Management Academy, which has campuses in Melbourne and Brisbane, as well as Wizard Corporate Training, which is on George Street in the Sydney central business district. It also operates International Training College on the Gold Coast. 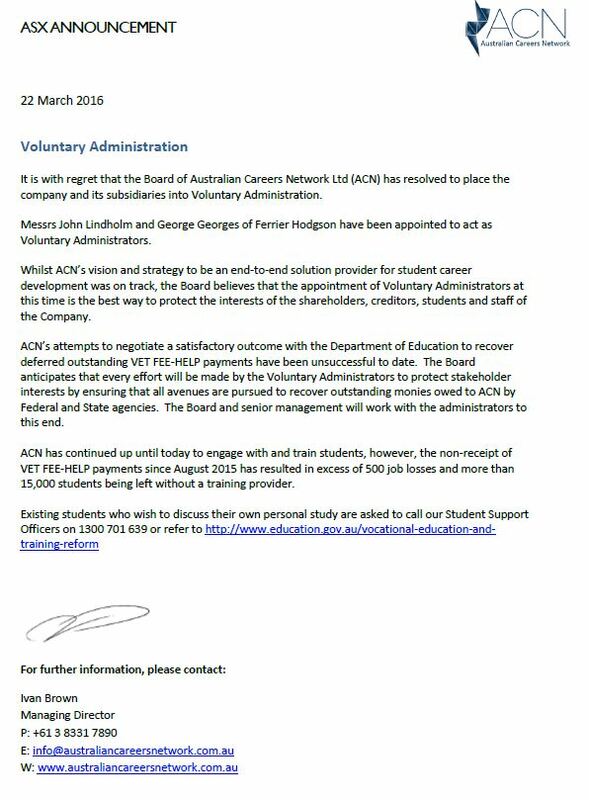 Its flagship Phoenix Institute was deregistered by ASQA in January, although Phoenix and other ACN companies are still training 15,000 students — all of whom will now be left in limbo. In a statement, ACN chief executive Ivan Brown said the company “anticipates every effort will be made by the voluntary administers to protect stakeholder interests by ensuring that all avenues are pursued to recover outstanding monies owed … by federal and state agencies”.